This book by the Dutch scholar Jan Wim Wesselius presents yet another radical solution to the question hulking over OT studies like a malignant phantom: Who wrote the ancient history of Israel? Much depends on the answer—including the self-proclaimed legitimacy of the modern state of Israel. We recently considered Russell Gmirkin’s answer, which I personally find quite plausible: a group of Jewish scholars penned the Torah in Alexandria, c. 273 BCE, drawing on sources found in the Alexandria Library (particularly Berossus and Manetho). With admirable forthrightness, Wesselius asserts that the Primary History derives from one man alone—a “highly talented author who most likely lived and worked among the intelligentsia of Nehemiah’s Jerusalem, in the second half of the fifth century BCE” [p. 163]. This genius’ work “formed the conceptual and historical framework for the rest of the books of the Hebrew Bible, and from there for the host of literature flourishing around the beginning of our era.” Wesselius concludes: “From his work, in the final analysis, the great monotheistic religions of Judaism, Christianity and Islam took their point of departure. Our anonymous writer truly was the most successful author of all time” . It’s a remarkable thesis, and one that I don’t believe has been suggested before. Perhaps the first question to arise is this: “How then (or why?) do we detect several different literary strands—leading to the so-called Documentary Hypothesis? Gmirkin answers (quite credibly, I think) by positing that several different Jewish scholars were at work at the same time. Wesselius, however, refers to “composed literary dossiers”  and to a “threefold level of understanding” employed by his single anonymous writer. I find this explanation rather mysterious and consider it the weakest aspect of Wesselius’ book. [ix] The Primary History, the historical books Genesis–2 Kings at the beginning of the Bible which present one continuous historical account from creation to the fall of Jerusalem to the Babylonians in 587 BCE, to our great surprise appears to derive its structure, with nine books divided into three parts, namely book 1, books 2–6 and books 7–9, from the Greek-language Histories of Herodotus of Halicarnassus (written between about 445 and 425 BCE). This ultimate proof of closure and of authorial intention suddenly and completely reverses our view of the discontinuities and discrepancies in these works: from indications of the historical development of the text, thinly veiled by editorial work, they become literary phenomena, to be studied and explained on the purely literary level. In this book it will be argued that the author of Primary History made extensive use of the work of Herodotus, especially for the part that deals with the period before 1000 BCE, i.e., before the beginning of the monarchy in Israel; and, perhaps more importantly, that Primary History can very well be read in contrast with Herodotus’ Histories, indeed that it must be read in conjunction with that work in order to be properly understood. Wesselius detects numerous parallels between the Bible and Herodotus (see his tabulation to the right). Some are more convincing than others and, singly, none is particularly persuasive. After all, in two large bodies of literature, even exact parallels in action and situation would not be surprising. Particularly striking, however, is that in both the Bible and the Histories we have (with only a couple of exceptions) also the same sequence. This being the case, it strains credulity to suppose that the two works are completely independent. Once we place the first parts of the biographies of Joseph and Cyrus beside each other, we are struck by a large number of agreements. The cause of all problems is in both cases two highly similar dreams which the jealous members of their family interpret—with or without the help of professional dream-interpreters—to mean that the key figure is going to rule over his family (Gen 37:5–11; Her I, 107–08). In both cases the members of the family attempt to prevent this prediction coming true by killing the key figure, a measure which to the reader appears rather radical in view of the absence of danger threatening the families (Gen 37:18–20). By their actions to accomplish this, ironically, they are instrumental in establishing the situation they wanted to avoid, though it would not at first appear to be so. The key figure is saved in both cases by the intervention of two persons, mostly members of his family (Joseph’s half-brothers Reuben and Judah in Gen 37:21–22 and 26–27, and Harpagus and the shepherd in Her I, 109 and 112–13), who apparently do not act this way out of love for him but because they do not want his death on their conscience. In both cases the family relationship is expressly referred to. The first person causes a temporary reprieve by proposing or ordering the key figure to die from exposure instead of through violence, and the second one saved him by causing him to disappear from the view of his enemies. 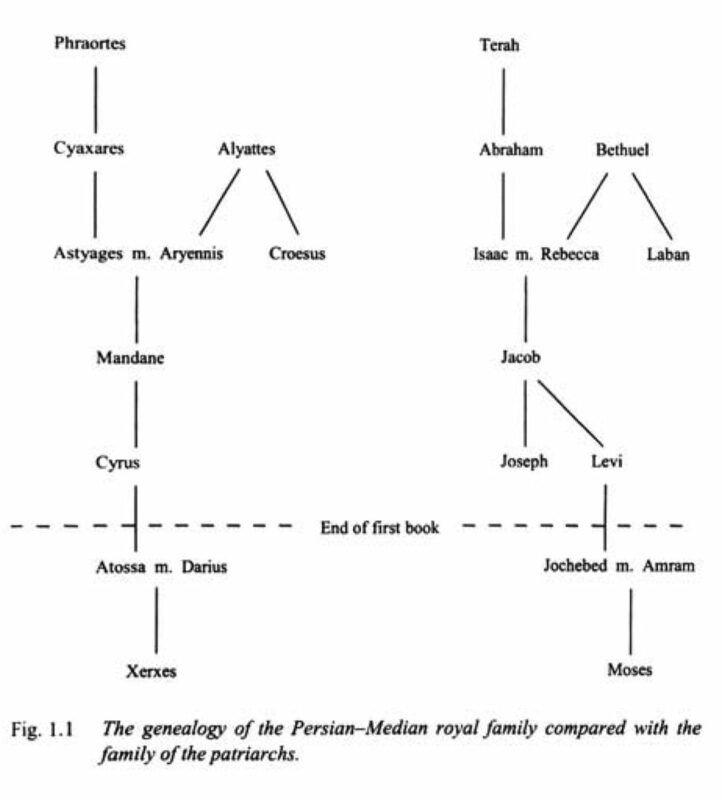 The result is that the key figures come to live in very modest circumstances (Cyrus for 10 years according to Her I, 114, Joseph for 22 years according to a combination of Gen 41:46, 42:53–54 and 45:5). Both key figures are said to be beautiful at the time of their disappearance (Gen 39:6; Her I, 112). Both are dressed in a many-colored garment, which is later used to convince their father or grandfather that they have been killed by wild animals (Gen 37:3, 31–32; Her I, 110, 111, and 113). Both receive another name when they finally come to power: the king whom we know as Cyrus bore another name at first according to Herodotus, and was only later called Cyrus (Her I, 113, 114), Joseph receives an Egyptian name, sopfnat paalneah, from Pharaoh (Gen 41:45). Both are said to be informed by the divinity about the future in dreams (Pharaoh against Joseph in Gen 41:38–39, Cyrus about himself in Her I, 209). Finally and perhaps most importantly, both key figures are the first to come to power in Egypt and the Lydian capital Sardis respectively, the places that were to be the starting point for the great campaigns of two generations later. Thus Wesselius joins MacDonald, Brodie and Gmirkin in listing, describing, and analyzing numerous parallels between scripture (Christian or Jewish) and his chosen ‘pagan’ source(s). Another instructive illustration from his book is below. Detractors call this sort of work “parallelomania.” Yet one cannot simply dismiss such scholars as quacks. Those mentioned above are all serious and, except for Gmirkin, they are (or were) working academics in the field (Wesselius is Senior Lecturer and Head of the Department of Semitic Languages at Kampen Theological University, the Netherlands). The research of these and other independent-minded scholars is increasingly showing that both the Old and New Testaments were indeed heavily indebted to pagan models. We’ve suspected this for a long time. Until the last generation, however, the parallels were mostly of a vague theological nature (how the God Jesus—his birth, death, and resurrection—relate to pagan antecedents). But now scholarship is revealing more specific literary relationships. We’re starting to connect the dots, and the results are compelling: Holy Writ was consciously modeled on numerous pagan precedents, both religious and secular. The god of the Abrahamic religions appears more & more to be the god of thieves. Your observation indeed seems to be borne out on many levels, including politics, unfortunately.